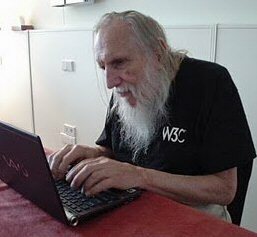 I met Bill at the CSUN Disability Technology Conference many years ago, and over the years he would talk to me about various ideas he thought I should be working on. Talking Signs of course was often top on his list, but he would talk about far more than that. Bill was a creative and out-of-the-box thinker. I’m sad to say now that we never had a project together, but I’m happy to feel like we might have. One thing I’d like to thank Bill for is encouraging me to get to know Harriet Johnson. Harriet was a wonderful big hearted person and a brilliant, thoughtful and hardworking advocate. Now they are both gone, and the world is a poorer place for because of it. Bill Loughborough was a man of diverse interests, a true believer in the deepest kind of accessibility, who was not afraid to speak his mind. He will be missed. Read more about the many facets of William Loughborough. Read the Web Accessibility Initiative tribute.